As a celebration of reaching this milestone we decided to press 300 12" vinyl versions, as we felt this release deserved to be released in this format. This EP is Flashback's first release in over 20 years, making it even more special. 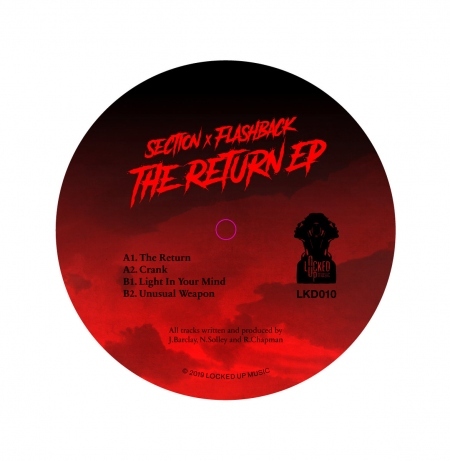 'The Return' is an amen-driven track with low, pounding 808s. The gem of this tune is the second drop, which has been destroying dancefloors whenever it's played. 'Crank' is an atmospheric roller with a clever switch to keep the dance bubbling. 'Light In You Mind' uses the famous think break to create nostalgia, but its contemporary arrangement and effects ensures that it will stand up in any DJ set. 'Unusual Weapon's' stabs hark back to the mid 90's and its chopped amens and Reese's are a nod to the legendary Digital and Spirit.